Hillary Chybinski: music musings. . .
. . .have you heard of jonas brothers? they are the latest in a stream of Disney mega stars. . .and i have to say, they are pretty talented. . .don't get me wrong - they are not Bono or Sting (yet). . .but they can rock it out and when ryan cranks up the volume in his room i don't shudder. . .
i can only keep my fingers crossed that his taste in music keeps at least a little in line with mine. 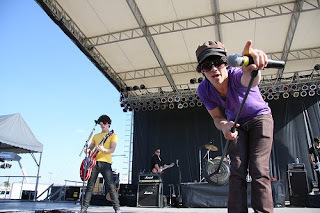 . .
My nieces went to a Jonas Bros concert last week. Right now, they are the cream of the crop in their eyes.